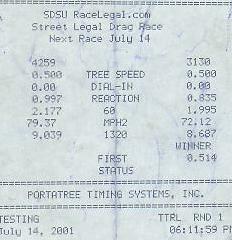 Time slips for my GT on 07/07/2001 at Carlsbad Raceway in the heat of the day. Had a little trouble with the 60' times. Timeslip for the 1/8th mile at Qualcom. I was car 4259. I was racing a Supra shopping cart with slicks. I had just installed my 155lph fuel pump and regulater. It improved my 1/8th mile time by a tenth and a mph. 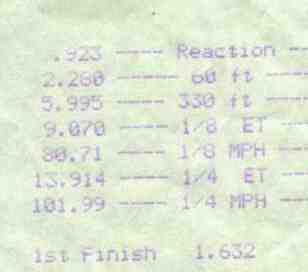 Timeslip for Aug. 4th@ Carlsbad Raceway after the intake and mass air. Alot of problems with traction, but ran at Carlsbad with spare tire and tool box and I still have stock heads.